I can't believe its October already and with that brings Halloween! Both James and Evelyn love dressing up so for them Halloween is a great opportunity for them to dress up and get suitable spooky! We tend to take them along to a organised Halloween party rather than trick or treating and so that means they both get dressed up to join in. 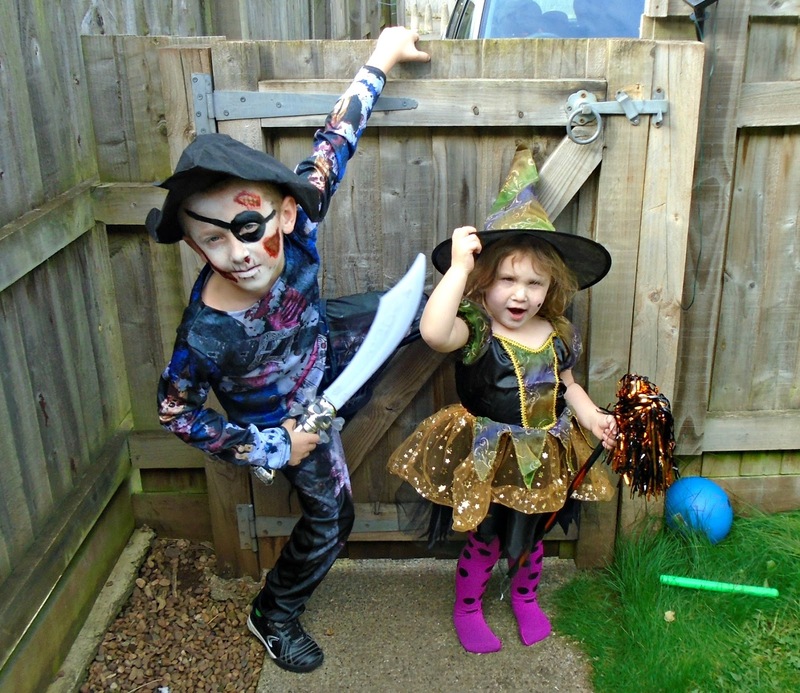 So when the lovely people over at Tickled Pink Fancy dress offered us Halloween costumes for both James and Evelyn to review the kids were so excited! I let them choose their own outfits, James went for the Jolly Rotten Pirate Boy costume and Evelyn chose the Elegant Glitter Witch costume both of which I think were great choices. There were so many great costumes to choose from though! 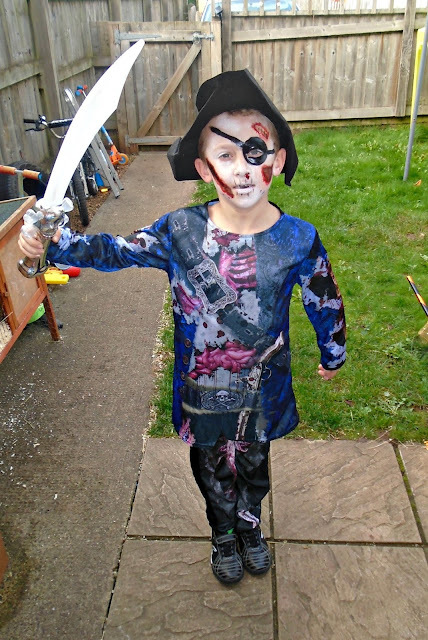 The Jolly Rotten Pirate Boy costume is made up of a gruesome printed top, printed trousers and hat. The detail on both the top and the trousers is very good and pretty detailed. James loved the bloody body parts and thought they were great. The quality of the print of the costume is good too, I have put this through the wash and the designed has not faded, peeled or cracked at all! This costume is available is size small (4-6 years), medium (7-9 years) and large ( 10-12 years). I would say this costume is true to size and as the trousers are elasticated they do seem to stay up pretty well. The only criticism I would have would be that the pirate hat this outfit comes with gets quite squashed in the packaging so will need some folding and adjusting before wearing. To complete James look I used some gory scar and cut transfer tattoo's a pirate sword and some face paint for his eye patch! The Elegant Glitter Witch costume came as a one piece dress plus a matching witches hat. The skirt of the dress is made up of 3 layers, a base layer which matches the top and 2 layers of tulle (1 black and 1 orange). The skirt is then covered is gold swirls and stars making it a very cute spooky outfit. I would recommend giving the dress some time hanging up as the skirt had become a little crumpled in the post but hanging for a day or so solved this! This costume is available in small (3-4 years) or medium (5-6 years). I would say the sizes are roughly true to size but if anything a little on the smaller side. Evelyn usually wears 2-3 years clothing so we ordered the small and it fit really well, there is definitely room left to grow though! 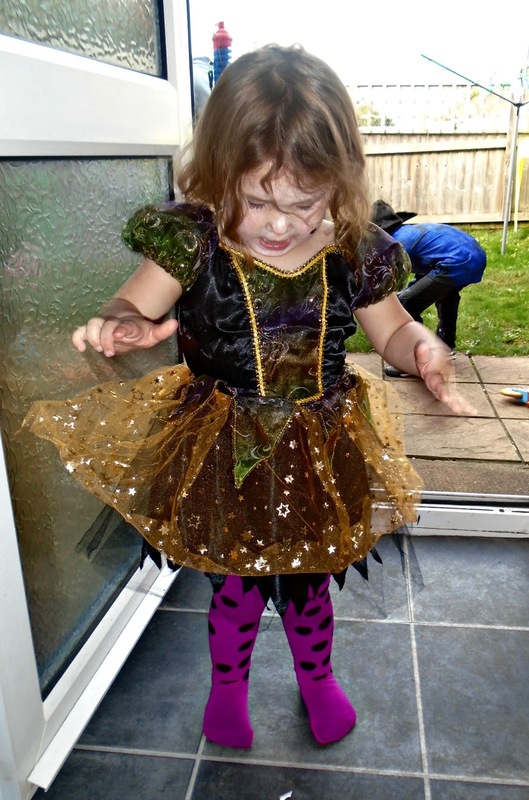 I paired Evelyn's costume with some spotty pink tights and a glittery broom (which can be seen in the photo below). James and Evelyn absolutely love their Ticked Pink fancy dress Halloween outfits and can't wait to wear them to the Halloween party at the end of the month! 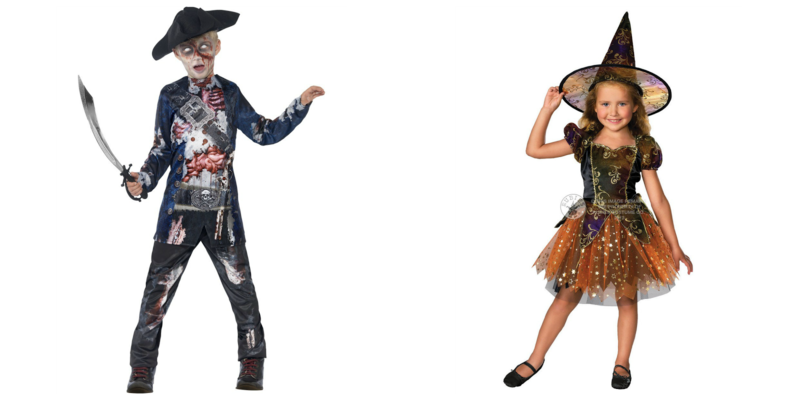 Both costumes feel like good quality and are a great price too (both outfits were priced at £14.99 each). 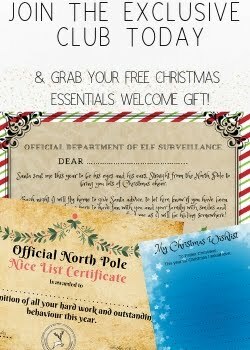 If you want to check out these outfits or more of the great outfits Tickled Pink Fancy dress have to offer check out their fancy dress website. Are you or your children dressing up for Halloween? If so what as?